[124 Pages Report] The timing belt market is estimated to be USD 5.90 Billion in 2016 and is projected to grow at a CAGR of 5.21% from 2017 to 2025. Increase in vehicle production and rising adoption of direct injection is driving the growth of the timing belt market. In this study, 2016 has been considered the base year, and 2017 to 2025 the forecast period, for estimating the size of the timing belt market. This research study involved the extensive use of secondary sources such as European Automobile Manufacturers Association (ACEA), Organisation for Economic Co-operation and Development (OECD), and the International Organization of Motor Vehicle Manufacturers (OICA), directories, and databases to gather and classify facts and figures useful for a technical, market-oriented, and commercial study of the automotive timing belt market. Primary sources include experts from the core and related industries, suppliers, manufacturers, distributors, service providers, and organizations related to various segments of this industry’s value chain. The size of the timing belt market has been estimated by using the bottom-up approach. In this approach, the country-level vehicle production of passenger cars and commercial vehicles is derived from various secondary sources and paid databases. The installation rate of timing systems in different vehicle types is used to estimate the market of timing drive systems at a country level. The average price of different timing belt systems has been analyzed for different countries, vehicle types, and drive types and is then multiplied with the country-wise volume of timing drive systems. The summation of all regional markets including Asia Oceania, Europe, North America, and RoW helps to provide the size of the global timing belt market, in terms of value (USD million). The below figure illustrates the break-up of the profile of industry experts who participated in primary discussions. The ecosystem of the timing belt market consists of manufacturers such as Continental (Germany), SKF (Sweden), BorgWarner (US), Tsubakimoto Chain (Japan), and others, and research institutes such as Japan Automobile Manufacturers Association (JAMA), European Automobile Manufacturers Association (ACEA), Canadian Automobile Association (CAA), and Korea Automobile Manufacturers Association (KAMA). Along with the given market data, MarketsandMarkets offers customizations in accordance with the company’s specific needs. 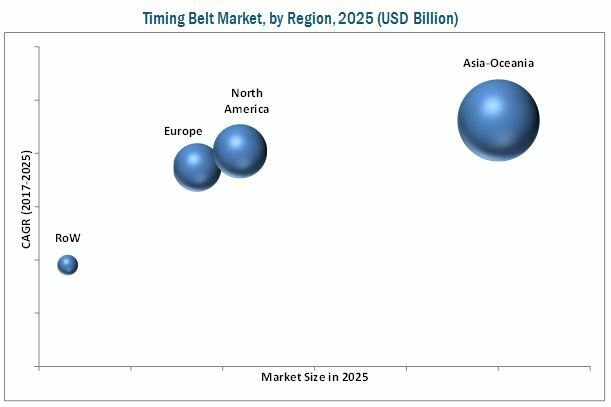 The timing belt market is projected to grow at a CAGR of 5.21% during the forecast period, to reach a market size of USD 9.22 Billion by 2025 from USD 6.14 Billion in 2017. The timing belt OE market is driven by the increasing adoption of direct injection engines and rising vehicle production globally. The growing vehicle parc as well as increase in average miles driven per year are identified as the key factors influencing the timing belt aftermarket. The passenger car segment is estimated to be the largest market, by volume as well as value, for the timing belt OE market, by ICE vehicle type. According to OICA publication, the passenger car production has increased from 59.89 million units in 2011 to 72.10 million units in 2016. This trend is projected to continue for the next five to seven years, owing to reasons such as rising consumer disposable income and vehicle ownership. Alternatively, the Hybrid Electric Vehicle (HEV) segment is expected to dominate the timing belt market, by hybrid vehicle type. The higher production and adoption of HEVs, as compared to PHEVs (Plug-in Hybrid Electric Vehicle), is leading to the growth of timing belt systems in HEV segment. Tensioners are expected to lead the timing belt market, by component, in terms of value. The types of tensioners may vary depending upon their application in a timing belt and timing chain. On the basis of damping structure, auto tensioners can also be segmented into hydraulically operated and frictional systems. The usage of tensioners in timing belts and chains and relatively higher pricing have led to the growth of the timing belt market. North America is estimated to lead the timing belt aftermarket by region. The high vehicle parc and average miles driven per vehicle have led to the growth of the timing belt aftermarket in North America. The vehicle parc for North America has grown from 302,513 thousand units in 2011 to 324,763 thousand units in 2015. As per OICA, the US contributed around 63.9% of the total vehicle parc of North America in 2015. Mexico and Canada contributed 9% and 5.6%, respectively of the total vehicle parc of North America in the same year. Thus, the high vehicle parc shall positively impact the timing belt aftermarket in the region. Asia Oceania is estimated to be the largest and fastest growing timing belt market during the forecast period. Countries such as China, Japan, and India are the leading markets in the region in terms of vehicle production. The production of passenger cars is the highest in the Asia Oceania region and has grown from 40.57 million units in 2011 to 43.85 million units in 2016 as per OICA. Asia Oceania contributed around 60.66% of the global passenger car production in 2016 as per OICA. The availability of cheap labor is one of the primary reasons for the high vehicle production in the region. China contributed 55.69% of the total passenger car production in Asia Oceania in 2016. Japan and India contributed 17.95% and 8.39% of the passenger car production, respectively in 2016. These factors have helped Asia Oceania to become the largest timing belt market. 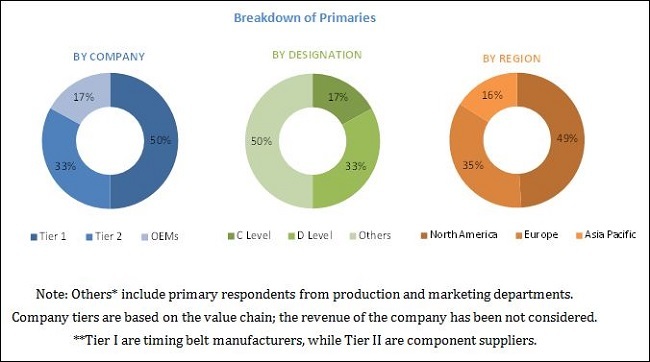 The increasing adoption of direct injection engines by automotive OEMs and rise in global vehicle production shall lead to the growth of the timing belt OE market. Also, rising vehicle population and increase in average miles driven per vehicle would lead to higher replacement and growth of the timing belt aftermarket. The timing belt market is dominated by key players such as Continental (Germany), iwis motorsysteme (Germany), SKF (Sweden), BorgWarner (US), Tsubakimoto Chain (Japan), and others. *Details on Overview, Product Offerings, Strength of Product Portfolio, Business Strategy Excellence, Recent Developments Might Not Be Captured in Case of Unlisted Companies.